currently campaigning for and news about our activities. A Calne landowner has made a permissible route to access a safer road exit point for BR38. DMMO success, Upgrade Orders Confirmed for Chirton Bridleways 11, 12 & 19 plus a new Restored byway URCH 51. Notice 130 served and now gates secured in the open position on West Lavington BY/BR34. New bridleway gate set back from the road edge installed on Collingbourne Kingston BY1. Parish Clerk cleared Seend BR 40 & 41 and added signage. And did you know that the committee scrutinize all planning applications to see that no threats are being made to existing routes. There are many benefits of becoming a committee member or an Area Representative such as prioritization of issue resolution in your area, fantastic knowledgeable support from existing experienced committee members, inclusion in all WBA meetings and copies of meeting minutes i.e. total awareness of all issues, connections with influential decision makers, ability to offer your localised community support and being happy in the knowledge that you are contributing to preserving bridleways in your local vicinity for everyone. If you can volunteer to support us and in turn your local riders, please get in touch here. 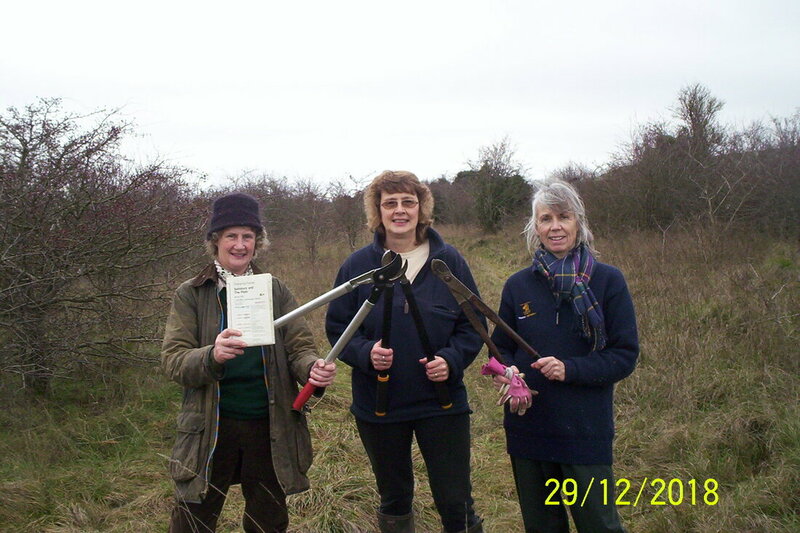 On Sat 29 December 2018, having secured the agreement of SPTA , three WBA committee members plus a visiting friend from New Zealand, armed themselves with loppers and pruning saws and set about clearing the hawthrone bushes along a 300mtr length of a newly dedicated Permissive Bridleway. The new dedicated Permisive Bridleway route is 3 metres wide and links the southern boundary of 'hard standing' opposite the main entrance of Rollestone Camp, Shrewton/Larkhill, with bridleway Shrewton 41. This new section affords equines a much safer off-road option avoiding the fast moving traffic along that part of the busy Rollestone Road. It is hoped that at some stage in the future, we may be able to extend north from the 'hard standing' towards the former Bustard Inn. An order has been made to divert BP5 for a period of 6 years to accommodate work at Hills Recycling. There were a very large number of objections to this plan, mainly from local residents; WBA was contacted by a one person who had undertaken vast amounts of in-depth and very impressive work to show that the diverted path is very likely to be under water for large periods of time in the winter due to the height of the water table. This track has been on WBA radar for quite some time. The landowner was disputing the entire existence of this path and there were several gates along it, some of which were being locked at random. We are pleased to report that it’s fully passable now, although some signs are absent and the part through the woods is slightly confusing. There are some ponies behind non-electric tape at one point, but the path is now ridable the entire length. This is great news for riders in that area. Very soon there will be some good news for riders in the Woodford Valley area. Footpaths 8, 25 and 26 are likely to get an upgrade to bridleway status, although the Inspector has not yet confirmed the order. Wilsford has a number of problem paths at present, which occur on the same person's land. Trees have been planted next to the Millennium Way track and it’s obvious that these will encroach on the track-width once they start to grow. A locked gate has also appeared on BR10. These have been reported to Wiltshire Council and the Chairman of the Parish Council. Marden BR6 also has a gate across it. The landowner has agreed to a meeting regarding a re-submitted claim from WBA on a path across the Bowood estate. WBA have been trying sporadically to reinstate bridleway rights on this path for many years. A trial of a permanent Traffic Restriction Order has suddenly popped up on 2 Byways near Stonehenge. The council are stating that the gates will be kept locked prior to Work starting on the A303 tunnel, which considering that it’s allegedly still in the consulting stage, seems rather worrying. Whatever your views are regarding this work, (the WBA committee agree that it’s a massive waste of taxpayers money), it seems wrong to block public rights of way before the final outcome has been “properly” decided. You could help us ! There are many benefits of becoming a committee member or an Area Representative. Prioritization of issue resolution in your area, fantastic knowledgeable support from existing experienced committee members, inclusion in all WBA meetings and copies of meeting minutes i.e. total awareness of all issues, connections with influential decision makers, ability to offer your localised community support and being happy in the knowledge that you are contributing to preserving bridleways in your local vicinity for everyone. In response to the entry published on Thu 20 Sep 18 at 21:15hrs, on the Wilshire Horse Riders Facebook Page and the subsequent resulting comments. I would first wish to draw your attention to the following, all of which are already in the public domain and freely available online. a. Minutes of Cherhill Parish Council meeting dated Tue 5 Jun 18, item 3454 - Countryside Access. b. Cherhill and Yatebury Parish News - Sumer 2018, page 2, Countryside Access - footpath reinstated. c. Minutes of Cherhill Parish Council meeting dated Tue 31 Jul 18, items 3462 - Public Participation and 3467 - Red Barn Footpath - CHER 27. On Wed 25 Jul 18, Wiltshire Bridleways Association, (WBA) received a request from a representative acting on behalf of the horse riders of the Cherhill area, asking for WBA support for their endeavour to reverse a recent decision by the parish authorities to cancel Permissive Bridle access over Cherhill footpath 27. It was reported that permissive rights had been in existence for approximately 30yrs without any interruption or objection. This closure would force any rider travelling east-west and vice versa onto the busy A4 trunk road, a two lane highway restricted only by a 40mph limit. I, as WBA chairman attended Cherhill Parish Council meeting on Tue 31 Jul 18 at which it was disclosed that the situation had already been resolved and permissive bridle rights restored. I would like to make it clear that at no stage have WBA suggested that anyone had complained, and reference to the WBA newsletter, Sep 2018, is totally inaccurate and offensive. At this stage it is felt appropriate that the author of the FB article of Thu 20 Sep 18 should publish a Public Apology and retract the entry. WBA committiee members are all volunteers who work consistently to protect riders rights and promote safe off road riding throughout Wiltshire. By getting involved with the WBA riders can actively influence outcomes and support their local riding community. We welcome new members and commitee members at any time who will work with us to protect and preserve our riding routes across the county. Width varying between 6 & 9mtrs. Visited by our chairman following the report of blockage. Totally inaccessible to carriage drivers, riders or cyclists. Accessible in part only on foot but with extreme difficulty. Not an uncommon issue accross the county. Additional work has since been carried out to clear some fallen trees which were blown over by high winds. Thanks also to the local land owners and Wiltshire Area Warden for the action. More improvement work will follow. Hidden at on point along this route is the William Pitt plaque, which is advertised as an attraction by the Wiltshire Tourist Board. Although reasonably clear around the plaque, it was not previously accessible to visitors due to the path blockage. New equine appropriate bridges have been installed on Pewsey 33 which leads into Milton Lilbourne 18A. Do make a hack out that way and enjoy easy access to further routes from there. Following lengthy communications (with plenty of photos) our Chairman has enabled this bridleway gate to be improved. Richard Broadhead and in particular Stephen Leonard, Senior Rights of Way Warden for Wiltshire have worked with us on this to get resolution. Full report to be put on our web page very soon so that everyone can see more about what we do for you to enable enjoyment of safe bridleway access. Continuing our campaign to ensure all routes are correctly sign posted we work with numerours other organisations to get signs replaced and reinstated. WBA will submit a monthly report to the Open Spaces Society as outlined in this article by Smallholder magazine. Exact location of the missing signage and designation of the PROW will be required, so do ensure that you identify the right of way correctly on your report. I am often alone when I ride on the West Chisenbury to Gore Cross section of the Salisbury Plain, which I find odd as it is so fantastic to ride up there so to give you an idea of what you might enjoy if you boxed up here is jJust a short section of a long ride that takes in a bit of the bridleways and byways on Salisbury Plain. The GoPro is on my chest and doesn't see how much I actually look about (be glad, it would be nauseating) and the volume is muted but you can tell when the tanks fire and oh boy, they were very loud that day! Here’s hoping we inspire some more equestrian riders to use the excellent bridleways and byways around Salisbury Plain and promote The Wiltshire Bridleway Association by becoming Supporters. Our Newsletters are quarterly bundles of equine and bridleway knowledge. Our newsletter is sent directly to supporters by email (preferably) or in the post. Make sure you become a supporter to receive your copy and get the latest news directly. the bridleways you use and enjoy. It costs just £12 for the year. These funds help us fight to keep routes under threat open and preserved for the future. 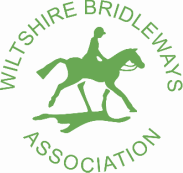 It is sometimes hard to see what the Wiltshire Bridleway Association commitee members do for riders in Wiltshire unless you attend a meeting, get involved with a bridleway petition or read the meeting minutes. If you wish to know more about what we do for you, do contact us directly, maybe you will read about an item that you reported in or know about?! Alternatively you could be come an Area Representative for the place you most ofen enjoy hacking around - there are many benefits including prioritization of issue resolution in your area, fantastic knowledgeable support from existing experienced committee members, inclusion in all WBA meetings and minutes i.e. total awareness of all issues, connections with influential decision makers, ability to offer your localised community support and being happy in the knowledge that you are contributing to preserving bridleways in your local vicinity for everyone. contact us directly for more details. I can confidently say that the committee members were genuinely disappointed by the attendance at this year’s AGM. Oh and yes, the committee members are all volunteers. 1 bridleway issue that has been a dispute since 1991, that’s 27 years of activity by numerous WBA committee members!!! You are unaware of the fact that in order to get physical attention to very overgrown routes, the WBA negotiated with Wiltshire Council, offering assistance and funds but despite three serious approaches our offers of support were declined. are next to and may infringe on public rights of way in order to ensure they are protected for your benefit. As it was our AGM, you missed hearing about our finances which were presented and explained by our diligent treasurer. 2, what is the benefit to being an Area Rep? – there are many benefits including prioritization of issue resolution in your area, fantastic knowledgeable support from existing experienced committee members, inclusion in all WBA meetings and minutes i.e. total awareness of all issues, connections with influential decision makers, ability to offer your localised community support and being happy in the knowledge that you are contributing to preserving bridleways in your local vicinity for everyone. Gave a brilliant, passionate and informative presentation about how ANYBODY could apply to record bridleways on the definitive map, before 2026 to protect our rights of way for future generations. So despite everyone who did attend last night having a really inspiring and informative evening, we really wish more of you had come along. Following the Public Inquiry held on 12 and 13 January 2016 and the submission of additional late claims which the Inspector had agreed in advance to accept, compounded by a lengthy illness of the Inspector, the decision report was not received until August 2016. Great news! The Inspector found in our favour and so following years of campaigning, the bridleway was upgraded to a 'Restricted Byway' and opened to its full width of 30 and 33 feet as appropriate, thus reconnecting direct access from the private road between Manor Farm livery, Teffont and this public right of way. A Local Public Enquiry took place in Teffont on 12th January 2016 before an Inspector appointed by the Secretary of State for Environment, Food and Rural Affairs. The Inquiry was convened under the Wildlife and Countryside Act 1981 Section 53. It arose from Wiltshire Council's recent Order made in response to an application by Wiltshire Bridleways Association. Wiltshire Council's Order, which is supported by Teffont Parish Council, orders that the public bridleway (Teff 9), running northwards from The Old Dinton Road (at Hillcrest) to the Old Ox Drove, should be widened to its historical width for the greater convenience and enjoyment of the public. with the Ox Drove (Path No.12). Width from the Old Dinton Road for 50 chains (1066 metres) north 33 feet, the remainder 30 feet wide. Approximate length 2.5kms. The Inspector is expected to report his decision and we will post an update asap.